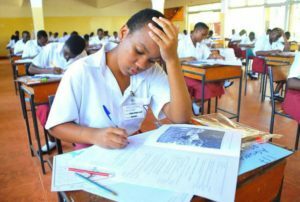 The Uganda National Examinations Board (UNEB) has released the 2017 UACE results with a decline in performance. Releasing the results on Wednesday, Mr Daniel Odongo, the UNEB executive secretary, said of the 101,269 candidates registered for the exams, only 34,819 students obtained at least three principal passes in the subjects they offered, with 1,141 students failing to attain any principal pass. Nevertheless, Mr Odongo said since a minimum of two principal passes is required for university admission, 60,941 candidates (60.7%) qualify. He added that 98.5% of the candidates qualify for the award of UACE, including candidates who obtained at least one subsidiary level pass in a subject at principal level. The UNEB executive secretary added that girls constituted 41.4% of the candidates who sat for the exams. However, he said a total of 101,269 candidates registered for UACE in 2017 examination as compared to 104,243 in 2016- a decrease of 2,974 candidates. A total of 41,932 female candidates registered for UACE in 2017. “Whereas gender parity has been attained at UCE, at this level (UACE), the gap between males and females taking these exams is still wide with parity index of 0.7,” he said.